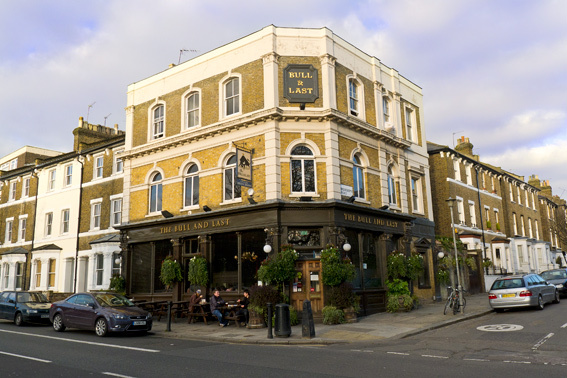 Today I had lunch in the Bull and Last – we were late in getting there, but they were still happy to serve us lunch at 2.50, as long as we ordered promptly. On top of that, the service was excellent. I ordered a Scotch egg as my starter, served cold and in half, with Colman’s mustard. The egg came slightly runny, in delicious pedigree pork, flavoured with sage. It could be the best one I’ve ever eaten. My main course was a warm, duck confit, salad. The shredded duck surrounded by green salad, came with a duck egg on top and tiny potato crisps. 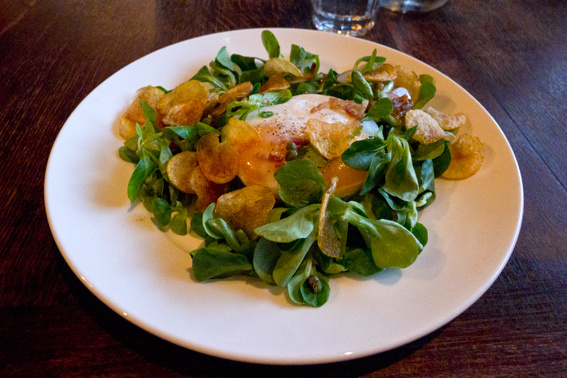 Aside from the melt in the mouth, creamy taste of the duck and egg, the texture of the salad, crisps, duck and egg combined was fantastic – crunchy, soft and succulent! I ordered espresso instead of desert, but they managed to sneak in a cube of chocolate brownie on the saucer, which was a very nice touch. I’ve been to the Bull and Last quite a few times and never been disappointed – I particularly recommend the charcuterie and the triple cooked chips. This entry was posted in Meat, Restaurants and tagged Bull and Last, charcuterie, Colman's mustard, duck confit, gastro, pub, restaurant, Scotch egg. Bookmark the permalink. It is a great place. One of the few Coren has given a 5 to. Great destination for a walk if you live anywhere near the Heath. 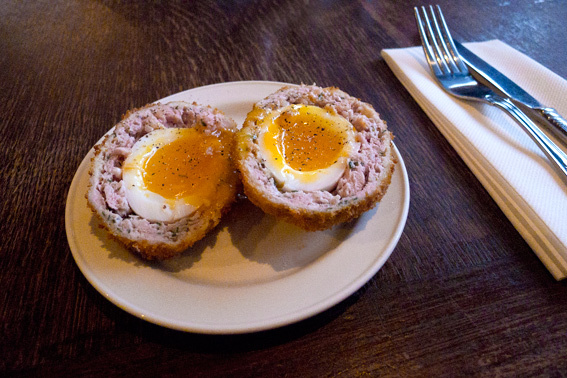 Time we made scotch eggs ….